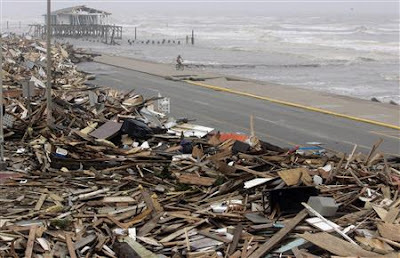 The Littlest Gator of Group News Blog asked how she could help in response to the devastation caused by Hurricane Ike (and, I presume for all of you, the losses from hurricanes since Katrina). Here's my recommendations, with an eye toward groups who have immediate demonstrated impact and/or long-term infrastructure restoration. Thanks so much for asking, TLG. And thanks to Minstrel Hussein Boy's addendum to my last post, which already began to answer this question with a link to CNN's What You Can Do. Austin is feeding and housing at least 6000 evacuees. Austin tends to draw refugees who are looking for strong people of color communities in Texas and more progressive places to land. We welcome several thousand from the New Orleans Superdome after Katrina, and many thousands of former New Orleanians now choose to live here, precious citizens to us (though many, understandably, still hope to eventually return home). But since Katrina, our local Capital Area Food Bank has been stretched to the limit with feeding those in need, not simply from hurricanes. They do unparalleled, open-handed work: For every $1 donated , the Food Bank can provide 5 meals to a hungry child, adult, or senior. For every pound donated in person, the Food Bank can provide the equivalent of .8 meals. Volunteer hours create the equivalent of nearly 20 full-time staff members each year. Or you can host a food & fund drive at your office, school or faith-based organization. Even a small team can make a big difference. Click on their link to donate money. Next to needing food, people will require homes in order to return to their normal lives. 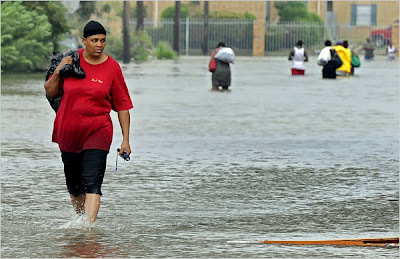 Galveston in particular will need help, and its survival carries extra emotional and cultural import. Ancestral home of the powerful Karankawa and Akokisa peoples, Galveston Island first enters European history as the location where Cabeza de Vaca was shipwrecked in 1528. During the early 1800s, it was home for pirate Jean Lafitte and other adventurers. Juneteenth, which is the oldest nationally celebrated commemoration of the ending of slavery in the United States, owes its origins to the announcement of the Emancipation Proclamation upon the return of Union forces to Galveston in 1865. Prior to the 1900 Storm which virtually wiped out Galveston, it had been known as "The Jewel of the West", with more money in the city than in Newport, Rhode Island. Galveston has a vibrant Jewish community of long-standing, with its first settlement of Europeans financed by Portugese Jew Joa de La Porta in 1816. The port was the hub of the Galveston Movement, funded by philanthropist Jacob Schiff, which "operated between 1907 and 1914 to divert Jews fleeing Russia and eastern Europe away from crowded East Coast cities. Ten thousand Jewish immigrants passed through Galveston, Texas during this era" and were settled in every state of the American West [from Wikipedia]. This is part of why Galveston has been called "Ellis Island of the West". Galveston also proved to be a desirable location for Vietnamese refugees fleeing to the U.S. during the 1980s. As of 2000, "the racial makeup of the city was 58.66% White, 25.49% Black or African American, 0.42% Native American, 3.21% Asian, 0.07% Pacific Islander, 9.73% from other races, and 2.41% from two or more races. 25.77% of the population were Hispanic or Latino of any race." About 22% of the city lived below the poverty line. To rebuild Galveston, my first thoughts turned to Habitat For Humanity, and they are already preparing for the job. Go to their website Habitat for Humanity to make donations or find out how you can assist. Direct Relief International provides access to health services for people in poverty. 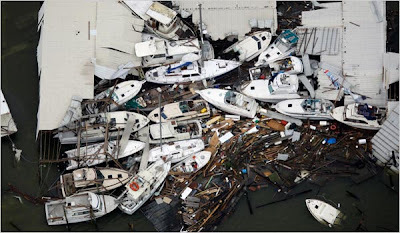 You may choose the program you want your donation to benefit -- one choice is hurricane preparedness and response, which covers the losses from Ike internationally, not just in the U.S. Along those lines, a donation to Doctors Without Borders will help address medical crises in the Caribbean from this hurricane season. If you want to focus on the remaining aftermath of Katrina, especially since both Gustav and Ike have had some impact on New Orleans, I'd recommend donations to INCITE! Women of Color Against Violence. (Hat tip to Feministe for a recent article about this group.) This is a national activist organization of radical feminists of color advancing a movement to end violence against women of color and their communities through direct action, critical dialogue, and grassroots organizing. They are particularly working in partnership with the Women’s Health and Justice Initiative and the New Orleans Women’s Health Clinic to address the disproportionate difficulty faced by women and children in New Orleans after Katrina. Feed The Children is a Christian-based organization whose financial accountability breakdown shows 83% of their budget goes to program services (childcare, food, medical, disaster relief, and community development), 13% management and 4% to supporting services. Their website states a $35 donation will deliver 250 pounds of food and water. Many evacuees are having to lodge their pets elsewhere, and of course many animals were rendered homeless by recent hurricanes. The SPCA of Texas is picking up the care for these animals. Go to their website to make a donation. If you have other philanthropic suggestions, feel free to add them to comments. And if you have already helped in some way, please tell us about it: It's not bragging, it is inspiring.